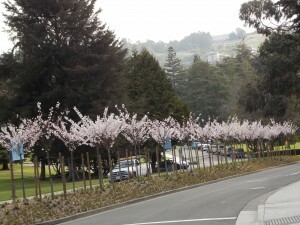 UC Berkeley Cherry Trees In Bloom! Upon being told that the Cherry trees were in bloom at UC Berkeley, I made sure to head over there the very next day and take pictures. What Cherry trees? And, where? They are located at the Westgate entrance at UC Berkeley. Gardeners’ Guild planted them – thirty-five of them! It is a project to honor UC Berkeley graduates of Japanese ancestry; their contributions to society. On April 6th at 11:00am there will be a dedication ceremony held at the Westgate entrance. https://www.gardenersguild.com/wp-content/uploads/gardenersguild-logo.jpg 0 0 sharris2011 https://www.gardenersguild.com/wp-content/uploads/gardenersguild-logo.jpg sharris20112013-03-29 22:59:532013-03-29 23:00:18UC Berkeley Cherry Trees In Bloom! 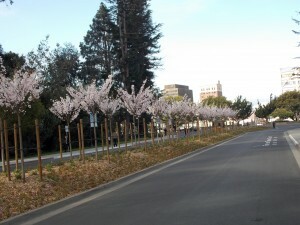 Wow, what a sight this will be in the coming years as these cherry trees mature. It appears that all of the plant materials specified for this project are doing very well at this location. What a wonderful tribute to the students at UC Berkeley. And thanks for the great work that our construction crew did to make this project come to life at the Westgate!